A deadpan comedy that evolves into a wry, politicized examination of truth, 12:08 East of Bucharest reconfirms—on the heels of last year’s The Death of Mr. Lazarescu—Romania’s emergence as a budding cinematic mecca. A superficially light affair that gains intellectual heft as its humor gathers steam, Corneliu Porumboiu’s debut is structurally bifurcated but thematically unified, charting the 16th-anniversary investigation by an egotistical local talk show host named Jderescu (Teo Corban) into whether the 1989 revolution that ousted communist dictator Ceausescu also occurred in his quiet, sleepy rural community. It’s a question, embodied by the film’s original title Was There or Wasn’t There?, that’s centered around whether December 22nd protests in the town square occurred before or after 12:08pm: if they happened before, then a revolution existed; if they came about afterward, then they were merely celebratory responses to the momentous events taking place in the capital. After his esteemed guests cancel their scheduled appearances at the last moment, Jderescu is forced to recruit Piscoci (Mircea Andreescu), an old man whose claim to fame was dressing like Santa Claus, and Manescu (Ion Sapdaru), a drunken professor who alleges to have spearheaded the neighborhood’s revolutionary demonstrations. 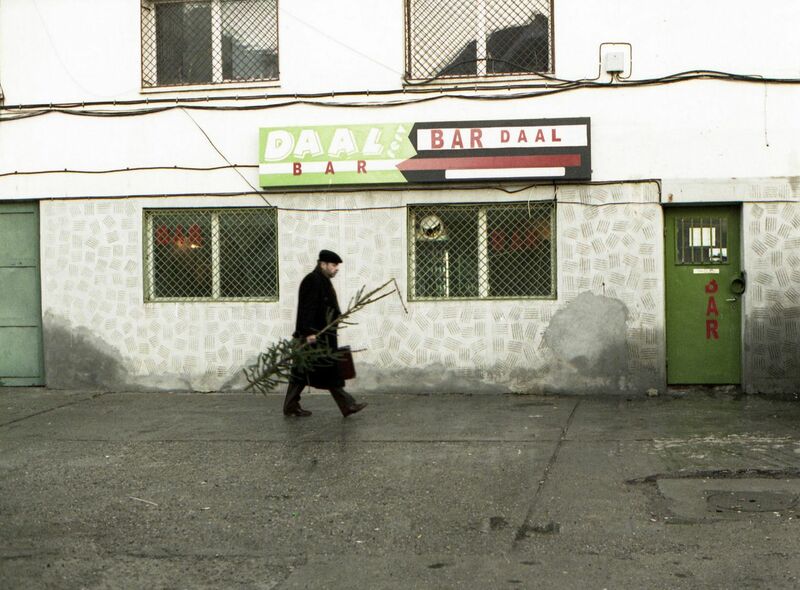 12:08 East of Bucharest‘s first half offers dry laughs via scenes of its three characters’ everyday lives and preparations for the show, with the director’s static camera and master shots helping contribute to the amusingly ironic—and yet consistently sympathetic—portrait of damp, downcast rustic Romania and the struggles, frustrations, failings, and foibles of its residents. At the midway point, the film shifts to a real-time, 45-minute depiction of the program itself, a thoroughly amateurish production in which the cameraman fails to competently use his three tripod-aided setups (an incompetence that Porumboiu, by assuming the cameraman’s place, playfully embraces), a bored Piscoci makes paper boats, and Manescu has his boastful claims about spearheading the rebellion challenged by disparaging callers. It’s during this extended, timeline-nitpicking sequence that the director produces his funniest material (much of it centered around awkward zooms and awful cinematographic framing) but also his most insightful reflections on memory, history, intolerance, and the ties between the personal and the political. As the train wreck of a TV broadcast stumbles toward its inconclusive conclusion, 12:08 East of Bucharest proves itself remarkably wise about life. An assured Porumboiu, however, refrains from aggressively pushing his various thematic points, his mise-en-scène so matter-of-fact that one is eventually taken aback (in the most pleasurable way possible) by the film’s astute arguments about truth’s unknowability and the virtue of men striving to make revolutions wherever and however possible—as well as by gorgeous bookending shots of town lights going on and off throughout the town that stand as a stirring symbol of the dissemination of political awakening.